Water-soluble GABAA antagonist. Methochloride salt of (+)-bicuculline (ab120107). Actions on neuronal Ca2+-activated K+ channels reported. Also available in simple stock solutions (ab146682) - add 1 ml of water to get an exact, ready-to-use concentration. Functional Studies - (-)-Bicuculline methochloride, GABAA antagonist (ab120110)Image from Corns LF et al., Neurosci Lett. 2013;553:57-62. Fig 2B. ; doi: 10.1016/j.neulet.2013.07.007. 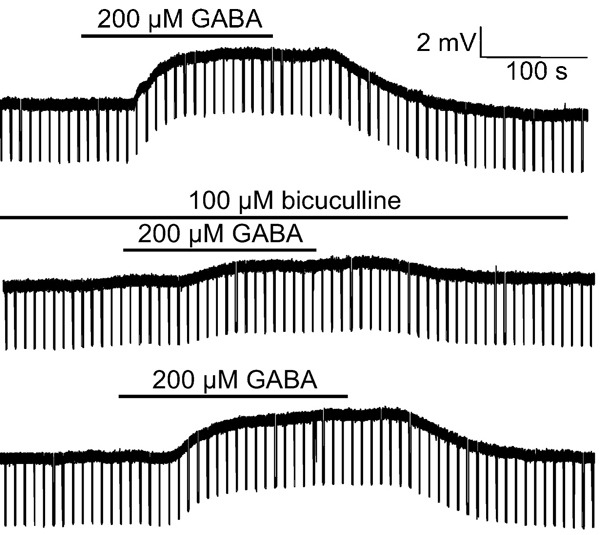 Current clamp recordings demonstrating that the depolarisation of ependymal cells in response to GABA (200 μM) is partially antagonised by bicuculline (ab120110, 100 μM) in a reversible manner. Functional Studies - (-)-Bicuculline methochloride, GABAA antagonist (ab120110)Image from Corns LF et al., Neurosci Lett. 2013;553:57-62. Fig 2Ai. ; doi: 10.1016/j.neulet.2013.07.007. 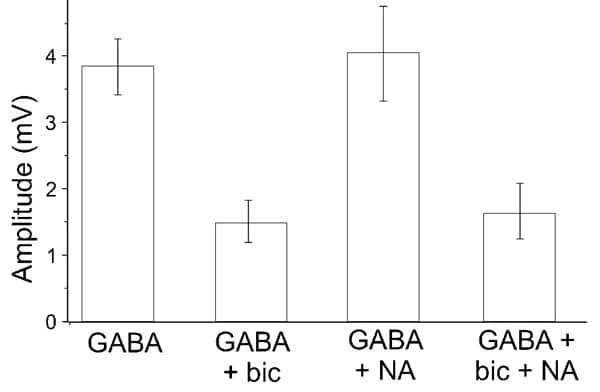 Group data for responses to GABA alone or in the presence of bicuculline (bic, ab120110) and/or nipecotic acid (NA). Publishing research using ab120110? Please let us know so that we can cite the reference in this datasheet. I would like to know the PKa value of Bicuculline methochloride! Unfortunately we don’t have a pKa value listed for this compound. I have done a quick literature search and nothing seems to be coming up. Usually if we have any such figures (IC50, Kd, pKa) we would list them on the datasheet.